After church and lunch with hubby Mike, one of our daughters Bethy, and her boyfriend Billy decided to wander through the local Barnes and Noble bookstore. I headed over to the aisle with Christian book and began wandering down the aisle, looking for YHWH on the shelves. I figured it would be under GP Taylor’s name first. However, I could’t find it. Not to be deterred, Mike went to the customer service desk and asked if the book was in stock. Being on pins and needles, I watched from the safety of another aisle. A moment later, the customer service rep led Mike to a different aisle. After another minute, Mike stuck his head around the corner and gestured to me. I headed over, followed by Bethy and Billy, to where Mike was standing and grinning and pointing. There, on the bookshelf, was YHWH The Flood The Fish and The Giant. We all stood there, grinning and then Bethy began taking pictures to upload to FaceBook. I took pictures to upload here. 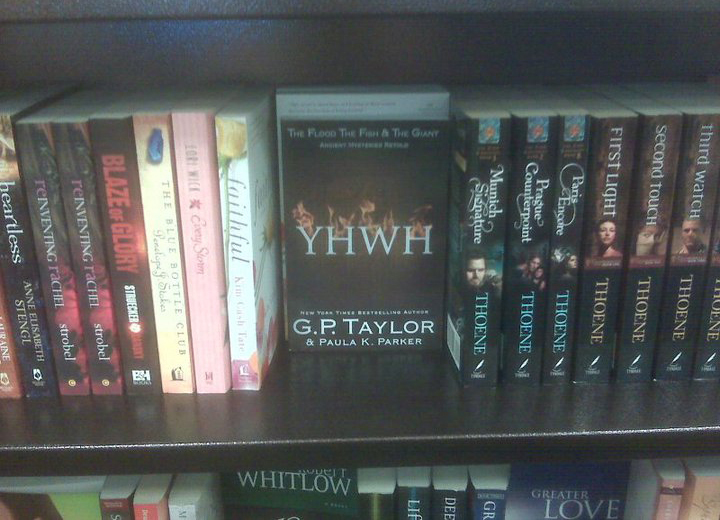 A extra special touch is that, on the shelf below YHWH is MY SOUL TO KEEP written by my friend Melanie Wells. My book is in such great company!